Greece warns that if informal EU leader Germany remains rigid on granting Athens a new deal, it will seek assistance elsewhere. The US, Russia and China are the possible candidates. 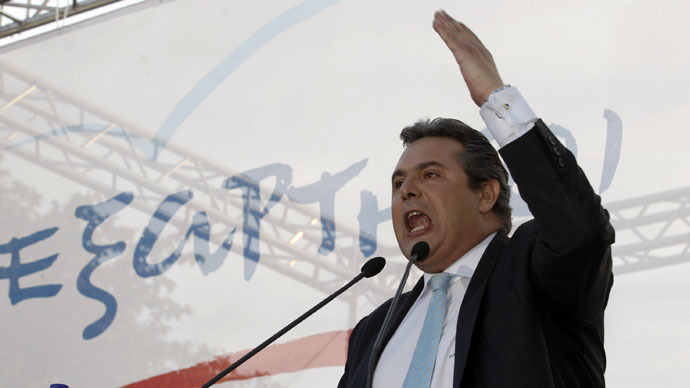 The warning came from new Greek Defense Minister Panos Kammenos, who assumed office after the populist Syriza party won a general election in January and its leader Alexis Tsipras took over as prime minister from Antonis Samaras. "What we want is a deal. But if there is no deal - hopefully (there will be) - and if we see that Germany remains rigid and wants to blow apart Europe, then we have the obligation to go to Plan B. Plan B is to get funding from another source," Kammenos told Greek television on an overnight show running into early Tuesday, as reported by Reuters. "It could be the United States at best, it could be Russia, it could be China or other countries," he said. Syriza gained a plurality of votes thanks to its EU-skeptic platform and a promise to oppose austerity measures imposed on the ailing Mediterranean nation by the "Troika" of foreign creditors in exchange for a debt bailout. Kammenos is not a member of Syriza, but comes from the Independent Greeks, an ally in the coalition government. In the program he said his party and Syriza had converging views on “80 percent of issues” and that way of dealing with the debt is among those they agree on. The new Greek cabinet wants part of the national debt written off, a demand that Germany has rejected. Athens also opposes some of Brussels' policies, most notably the anti-Russian sanctions over the Ukrainian crisis, which led to a painful trade war between Russia and Europe. In the wake of Syriza’s victory, Moscow indicated that it may consider offering a loan to Greece. Greek Foreign Minister Nikos Kotzias will visit Moscow on Wednesday to meet his Russian counterpart Sergey Lavrov, the Russian embassy in Athens reported on Tuesday.